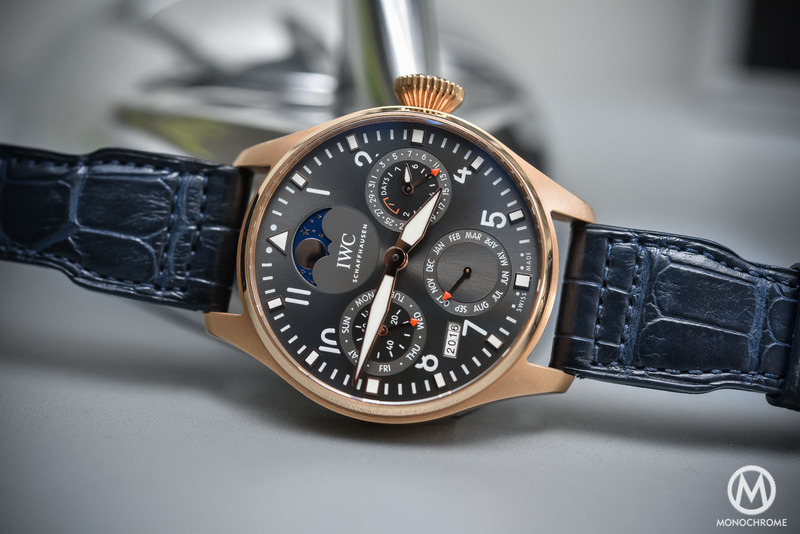 Today is the opening of the Pre-SIHH season for IWC, meaning that some novelties are to be expected. 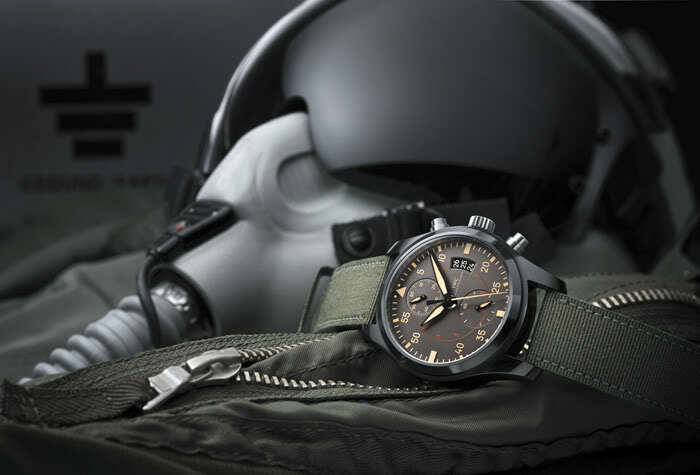 The theme for this year will be the 150th anniversary of the Schaffhausen-based brand. A very special year indeed, which will be celebrated with no less than 27 limited-edition models. 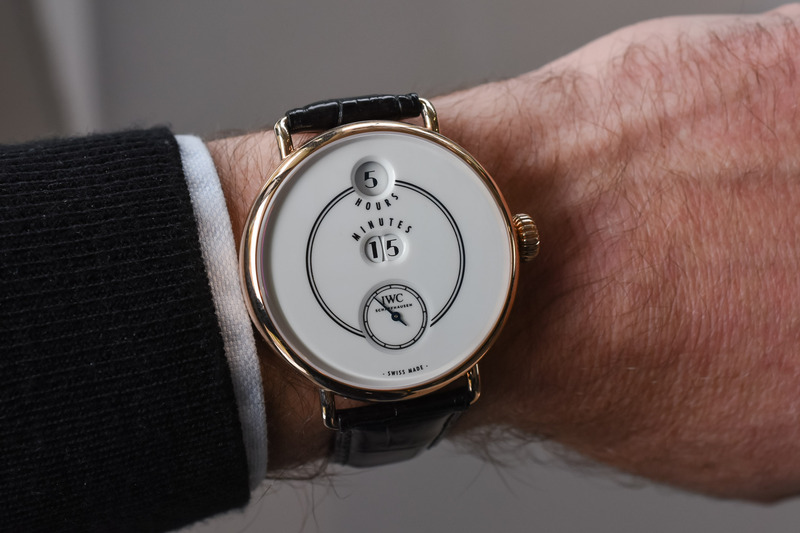 Among the 4 watches to be unveiled prior to the Geneva show is a completely original watch, a vintage reedition, not of a famed 1960s piece but based on one of the most iconic pocket-watches ever manufactured by IWC, the Pallweber. 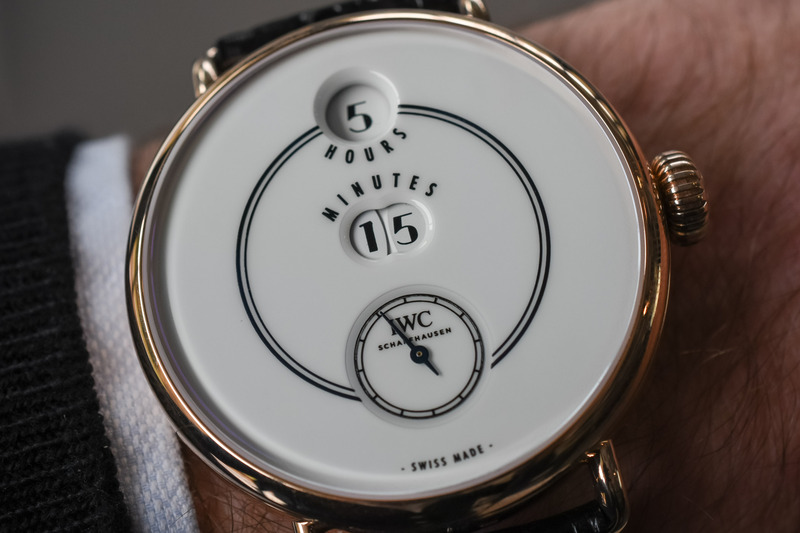 Here is the IWC Tribute to Pallweber Edition 150 years, With Digital Hours and Minute display. 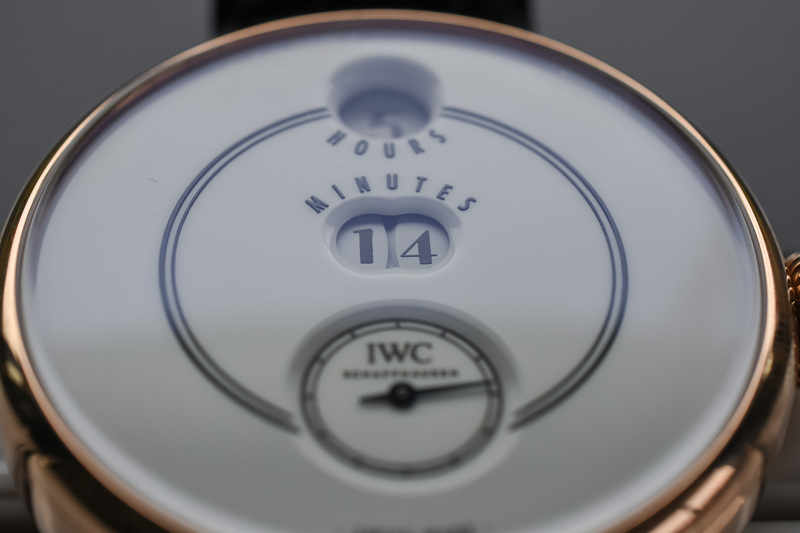 In 2018, IWC will celebrate the 150th anniversary of its inception. In 1868, an American engineer and watchmaker, Florentine Ariosto Jones (1841–1916) made a rather surprising move. At that time, he was a director of E. Howard & Co., in Boston, America’s leading watchmaking company at that time. While all its compatriots were rushing to the West, he decided to move in an opposite direction, to travel back across the Atlantic and to settle down in Switzerland, where he founded the International Watch Company in Schaffhausen – a company later known as IWC. To celebrate this important Jubilee, IWC will unveil a special collection at the SIHH 2018, comprising a total of 27 limited-edition models from the Portugieser, Portofino, Pilot’s Watches and Da Vinci families… And an extra watch, outside these regular families, which will pay tribute to the iconic Pallweber pocket-watches from 1884, a watch with digital hours and minute display. 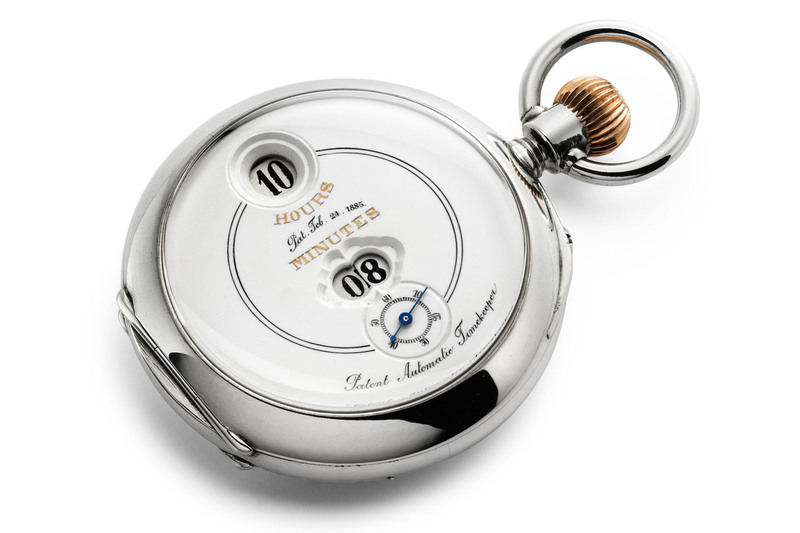 Before looking at this IWC Tribute to Pallweber Edition 150 years, we first need to make a jump back in time and look at the IWC Pallweber pocket watch. 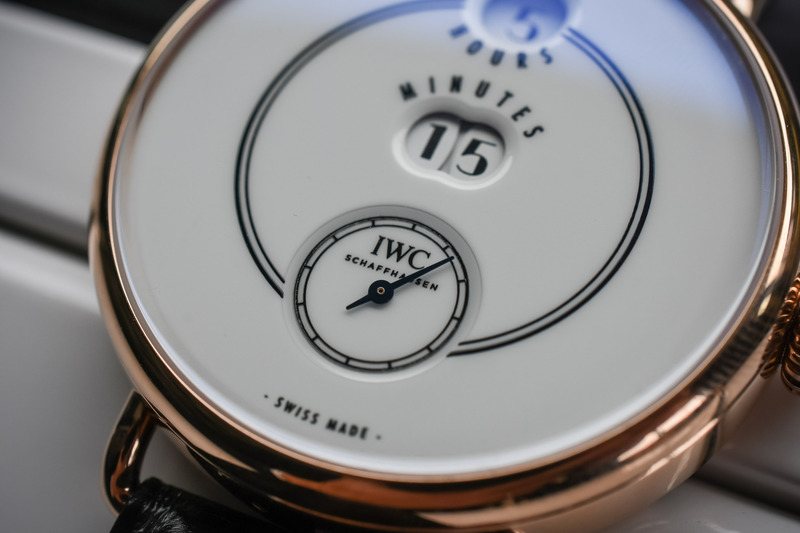 Together with the first pocket-watches created by IWC back in 1868, equipped with the iconic Jones calibres, one of the most coveted early pieces made by International Watch Company certainly were the Pallweber watches. These watches, which proved to be a commercial success at first (around 20,000 pieces produced in 6 years), showed a fascinating display based on a digital indication of both the hours and minutes – a first back then. 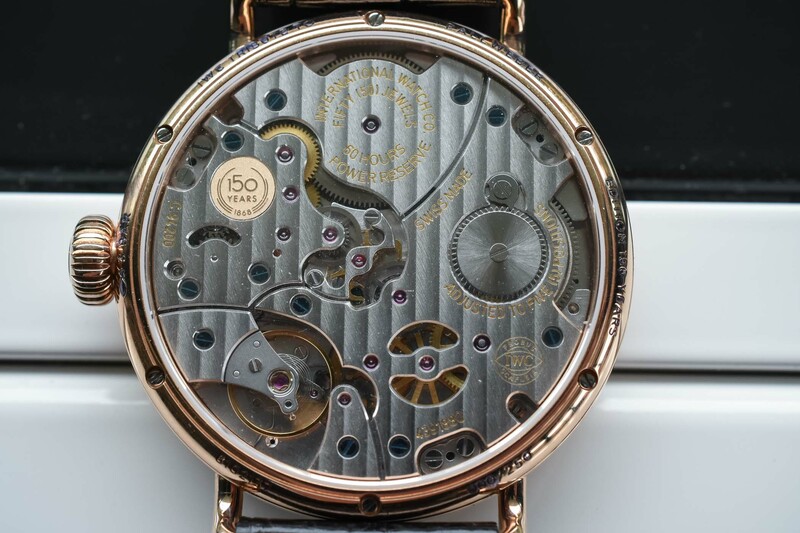 Developed in 1884 and based on the Pallweber system developed by a Salzburg-based watchmaker, Josef Pallweber, it showed the hours and minutes with large numerals on rotating discs, visible through 2 windows on the dial. The head of International Watch Company at that time, Johannes Rauschenbach-Schenk (whose family took over the company in 1880) was fascinated by this modern approach to displaying the time and secured the patents for the handless watches. Impressively, close to 20,000 pieces were produced in a short 6-year production period, although the initial success tailed off over the years, and production was discontinued in 1890. What remains though is an impressively modern display and a watch that is now one of the icons among the historical IWC collection. Based on this exact same display, IWC this year unveils a watch that is truly original, as it’s not part of any current collection and uses its own design codes. 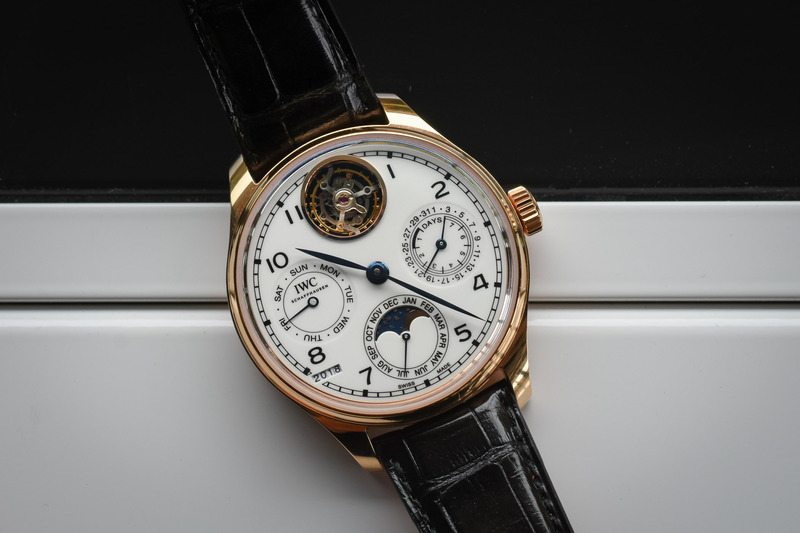 It feels IWC, although probably only to those who have an advanced knowledge of the brand’s antique (and not vintage) pieces. So it’s not IWC’s usual vintage-reissue. 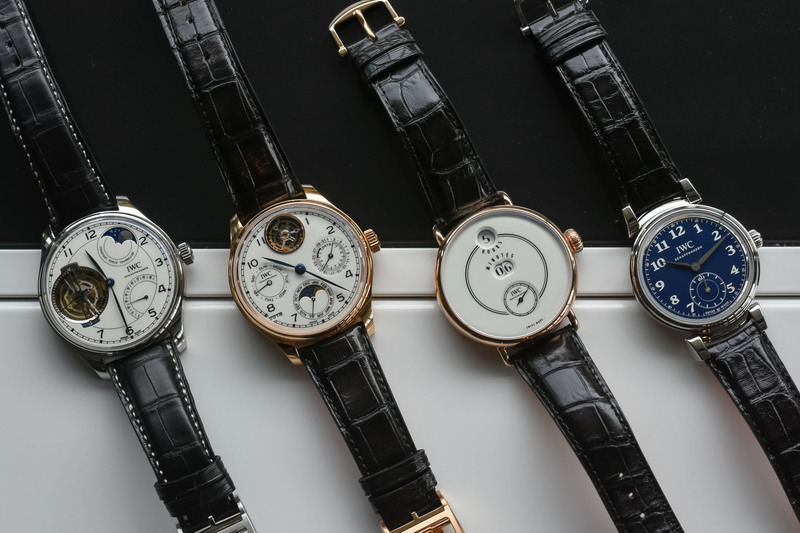 Yet, as this year will be committed to reviving some of the greatest watches ever created by the brand, whatever the era, seeing the superb Pallweber display brought back to life is pleasant. To stay true to the original concept of a pocket-watch with digital display, IWC made the deliberate choice to create a stand-alone piece, which is not part of one of the 6 current families (Aquatimer, Pilot, Portugeiser, Portofino, Da Vinci and Ingenieur). The case, to remain historically relevant, has been shaped like a pocket-watch on which wired lugs were later added. This early 250-piece limited edition will be available in an 18k red gold case measuring 45mm in diameter. Thus, thanks to these short and thin wired lugs, the watch feels surprisingly compact on the wrist – at least, let’s call it average dimensions for IWC. Fully polished, fully round, fully sleek, and fully pocket-watch inspired. As you can see on the wrist-shot below, the IWC Tribute to Pallweber isn’t a small watch, yet it isn’t void of a certain elegance, and this large diameter participates to the very special look of this watch. We couldn’t really imagine this watch with a smaller dial. The main attraction with this IWC Tribute to Pallweber certainly is the display, which relies on 3 separated indications: hours on top, minutes in the centre, and small seconds at 6 – all perfectly centred on the dial and creating a balanced display. Just like the antique Pallweber pocket watches, the same mechanics are used to provide an instant and original indication of the time, thanks to one main disc for the hours and two smaller discs, positioned one next to each other under the dial, for the minutes. In terms of design, the dial is a faithful tribute to the antique version. First, IWC has used lacquered dials that mimic the texture and colour of enamel. These dials are coated with up to 12 layers of high-quality lacquer, flat-polished, brushed and then imprinted several times to obtain some 3D inscriptions. The render is a smooth, milky and glossy surface that reflects the light and offers a great depth through the material. 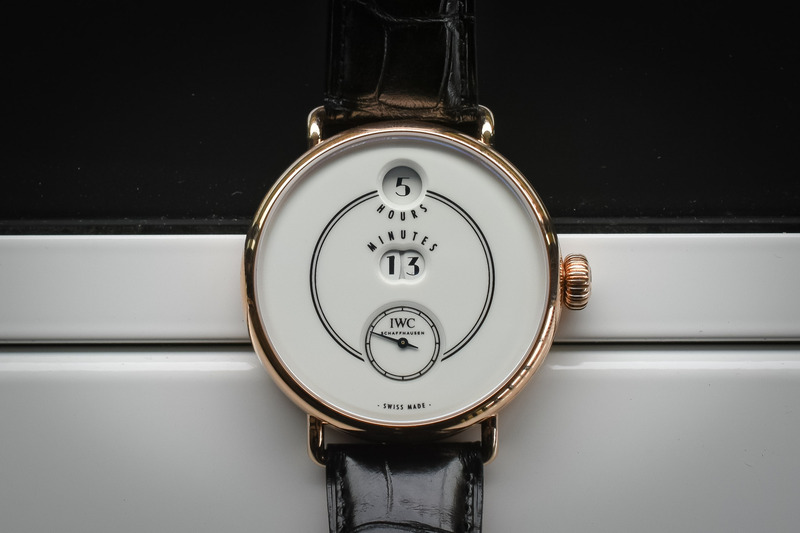 Where IWC also succeeds is the layout and “quietness” of the dial, by using the same double-circle and “hours”/”minutes” inscriptions as the antique version of the Pallweber, but not more than that. The overall dial is both discreet and fascinating to contemplate in various angles. To power this display, which IWC uses for the first time in a wristwatch, the brand had to develop a new movement in the name of the in-house Calibre 94200 – a movement truly specific to this Tribute to Pallweber Edition 150 years. While the antique watches rely on toothed cogs to actuate the discs, this mechanism was not viable in a modern timekeeper. IWC had to create a new technical solution (patent pending). In order to guarantee that this jumping hour/minute mechanism doesn’t influence the precision of the watch – as such displays are known to consume a lot of energy – IWC developed a double-barrel movement with two separate gear trains – one for the timekeeping part, one for the display. Right in the centre, the release mechanism that actuates the jumping minute disc – storing energy for one minute, unlocking every 60 seconds and locking again after. The energy required to advance the single-minute disc is supplied by a separate wheel train with a dedicated barrel. A release mechanism that establishes a connection to the watch’s main wheel train unlocks the train every 60 seconds and then immediately locks it again. The disc for the tenth is cleverly engaged by the minute disc itself. Every 10 minutes, the jump of the single-minute disc releases the disc for the tenth, which moves forward by one position. Finally, every 60 minutes, the hour ring jumps to the next numeral. The fact that the flow of power in the main wheel train is uninfluenced by the separate wheel train guarantees a precise rate and a high 60-hour power reserve. 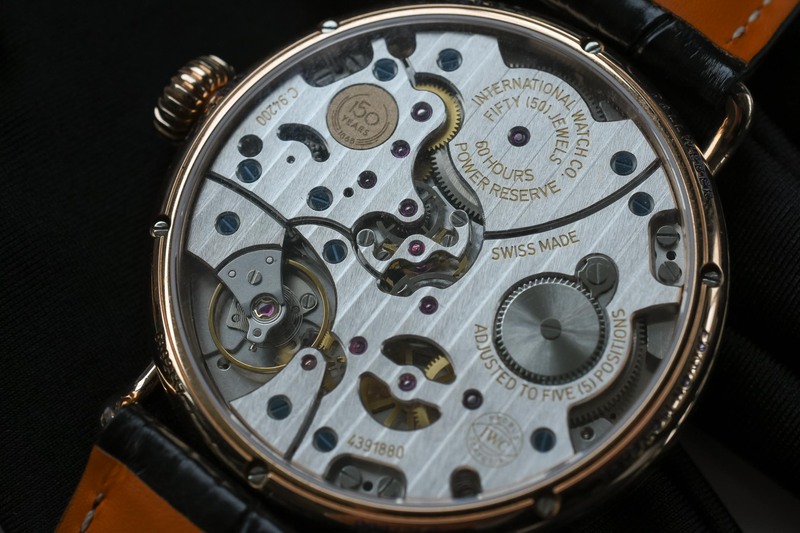 In terms of decoration and style, this Calibre 94200 is in the vein of IWC’s current production. Large and influenced by the style of pocket-watch movements, it entirely fills the back of the watch. It operates with a modern 4Hz frequency and will provide energy for 60 hours. The decoration is pleasant, with thin Geneva stripes, bevelled angles and blued screws. An 18k gold medallion on one of the bridges marks the 150th anniversary of the brand. 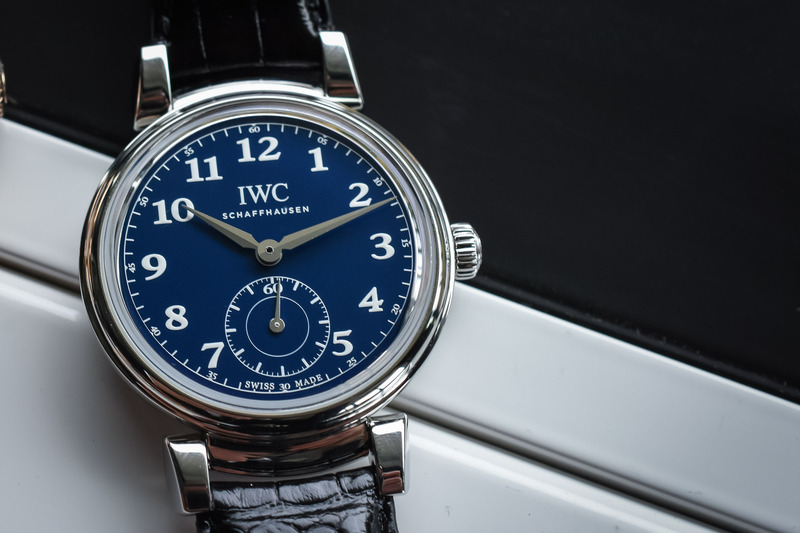 The IWC Tribute to Pallweber Edition 150 years is clearly a surprising watch, whether in terms of style, of inspirations or mechanical solutions. 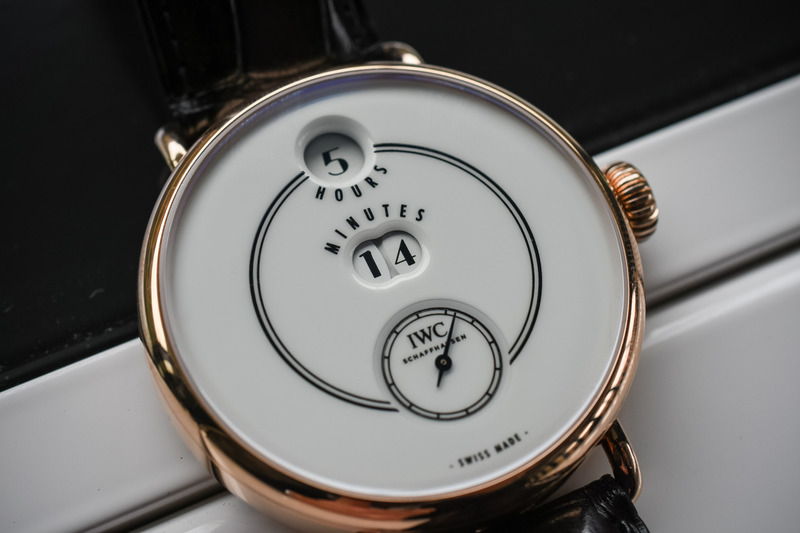 It certainly is not the usual IWC watch, yet it really feels captivating and perfectly executed. Price for this 250-piece limited edition is EUR 38,000. More details on iwc.com.